We reckon you'd welcome a TV that overcomes LCD technology's traditional problems with motion smearing with open arms. So, get ready to get touchy-feely with Toshiba's latest slab of 37-inch LCD elegance, the 37WLT68. The answer to the problem of motion smearing comes in the form of technology that's associated with high-end CRT TVs - 100Hz processing. Although this processing isn't needed for getting rid of flicker on LCD TVs, it makes sense to scan the picture 100 times a second (rather than 50) to add definition to movement. One glance at this Toshiba gets you ready to be impressed - it looks like a winner with its gloss black and silver livery. The 37WLT68 not all show, either, as this TV is bursting at the connectivity seams. There are three HDMIs (two at the back and a third down the TV's side); all of them 1080p-capable. Other connections include component video jacks, two Scarts, a PC input, subwoofer line out, and a CAM slot for adding subscription channels to the digital tuner. The TV's built-in digital tuner is backed up by a seven-day electronic programme guide (EPG). You're also able to scroll through the listings in 24hr slabs, in a user-friendly touch. There are plenty of other features on the go too. Active Vision LCD image processing, which has delivered great results on previous Toshiba TVs, is present and correct. There's a backlight control option that can automatically adjust the brightness of the LCD backlight, depending on the brightness or darkness of the image content. Other things of note include a black stretch mode, multi-level MPEG and standard noise reduction routines, and in-depth colour management tools. We used a Sky HD feed (through an HDMI) to see what the 100Hz processing can do. The results were impressive. While watching sport in hi-def it's immediately obvious to see that the processing earns its keep: players move with greater clarity without any side effects. The Active Vision M100 processing also benefits camera pans, as the picture glides rather than judders. Other picture positives with hi-def material include fine detailing and sharpness, which are both superb. Brighter material is also well-rendered and free from all kinds of video noise. Skin tones look authentic in light and dark scenes, which also enjoy a terrific amount of subtle greyscale information. Criticisms have to be levelled at the 37WLT68's rendering of dark areas. Sure, dark images are really detailed, but black levels are also a little shallow, meaning that dark areas can suffer from greying over, even with the automatic backlight in operation. The TV's trick of defaulting to a 4:3 ratio every time you switch to the HDMIs is slightly irritating, as are the sluggish onscreen menus and poor remote control. There's also something we can't put our fingers on about the softness of the standard-def pictures. 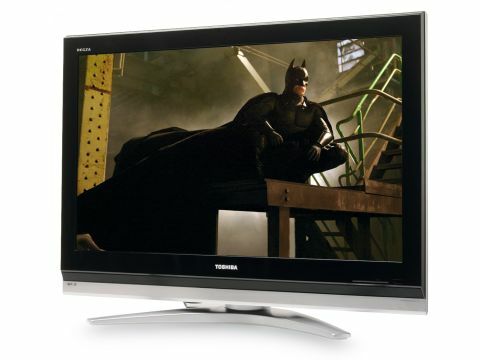 Complaints aside, Toshiba has pulled a blinder out of the workshop with this 37-inch LCD TV. The three HDMIs are certainly forward-thinking, and the Active Vision M100 processing really works. Now, if a few tweaks could be made in to the 37WLT68's black levels, Toshiba would have a real plasma screen worrier on its hands.